AxessPointe, based in Northeast, Ohio, is a federally qualiﬁed health center (FQHC), which is a not-for-proﬁt corporation that delivers primary medical, dental, mental and preventive health services in medically underserved areas. AxessPointe works to ensure open access to the medically needy throughout Summit and Portage Counties and makes sure the patient’s medication-related needs are met through a collaborative patient-centered approach. 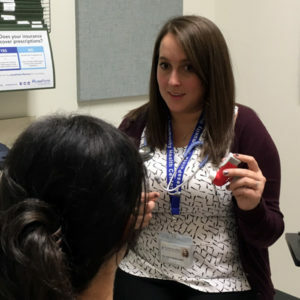 The clinical pharmacist, resident and fourth-year pharmacy students on clinical rotations, under pharmacist supervision, perform one-on-one comprehensive medication reviews for patients referred to the service by the primary care provider.